Folks, I need to as you all for help getting the word out on this Event. It could be a very unifying event if those of us in leadership were to all attend. I work with Editor Rob Pue (Wisconsin Christian News Newspaper) in-state with distribution and I have reached out to those in leadership I know personally. Support him by setting up a Table or at the very least Confirm you are going to attend this event and bring friends with you! to Support WCN and Attend at the least and if possible Get a Table and get your word out! 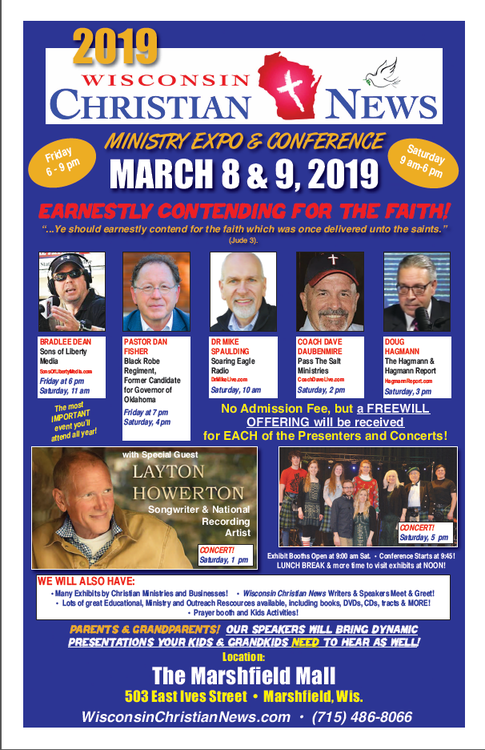 It’s that time again… I am announcing the details about our annual Ministry Expo and Conference for 2019! We will once again be holding the event at The “Marshfield Mall.” They did a great job for us last year, and our Conference room and Main Stage area was the perfect setup, with space for a lot more people than we had in previous years. THE DATES: Friday night and all day Saturday, March 8 and 9, 2019. LOCATION: The Marshfield Mall, 503 East Ives Street, Marshfield, Wis.
EXHIBIT BOOTHS: Because this mall is so full of stores, we are limited to about fifty booth spaces this year, so I would advise you to secure yours as soon as possible. Booth cost will be the same as previous years: $150. We will also have music by NATIONAL RECORDING ARTIST LAYTON HOWERTON and the MPK Christian Celtic Band. We will also have scheduled break times within the conference for people to visit the exhibit booths. RIGHT NOW, I need to know if you plan to join us and have an exhibit booth. I will be sending out more detailed information about this to those who respond. AGAIN, I WOULD ADVISE YOU TO RESERVE YOUR BOOTH SPACE AS QUICKLY AS POSSIBLE, AS OUR LIMITED SPACES ARE ALREADY FILLING UP! I am greatly encouraged and positive that this will be the BEST event yet, with such a great lineup of speakers and a GREAT VENUE at the Marshfield Mall. Please also check out the attached poster for details, and feel free to share with others.